The Arts & Science Journal for the Kingdom of Lochac of the Society for Creative Anachronism, Inc. (SCA, Inc.). Cockatrice is an email publication only via subscription with the editor. It is not a corporate publication of SCA, Inc., and does not delineate SCA, Inc. policies. How do I reference my sources? We also have photos on the theme of ‘What I’m Proud of from 2018’, and the results of the last two Kingdom A&S Competitions. Check it out, and enjoy! On Saturday, 1st September 2018, River Haven held its first Spring pilgrimage. 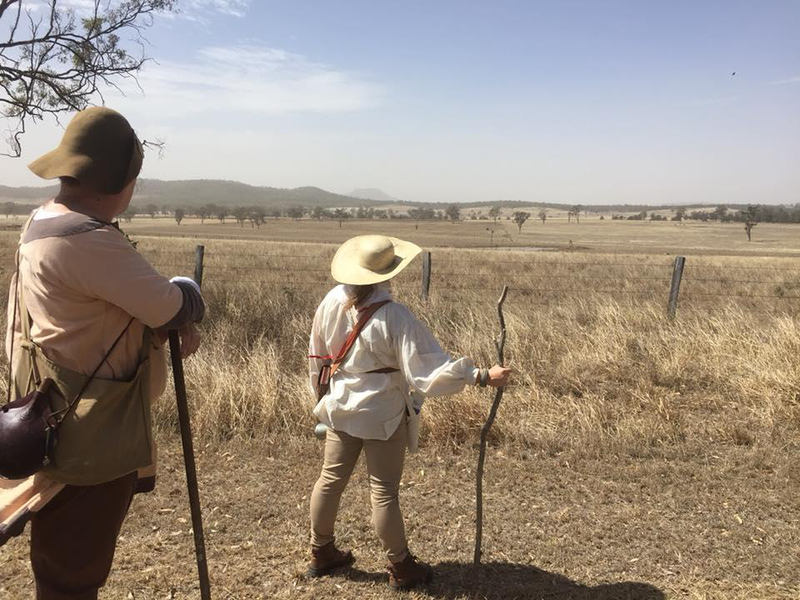 It was a walk of approximately 24 kilometres using the Bicentennial National trail between Thornton, Mount Mort, Greys Plain, and Rosevale. 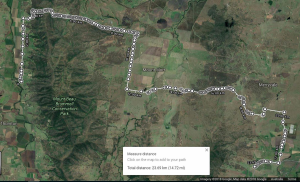 The pathway traversed the Little Liverpool Range and was mostly a mixture of quiet, gravel or bitumen country roads passing between open forest ridges and picturesque, pastoral grazing creek flats. As we walked we enjoyed long conversations ranging over as broad a topic selection as the valley we crossed, and the delights of a country stroll. Travelling at the slowest walkers’ pace, estimated at 3.5km/hr the pilgrimage took between seven and eight hours (including breaks). Commencing at 8 am, a luncheon stop was enjoyed at the 15 km mark after having negotiated Greys Plain. The pathway then used Mount Walker W road, and Rosevale road to arrive at St Paul’s Lutheran Church ground for a late afternoon tea. A light luncheon / afternoon tea was generously arranged by four members that did not walk. This was a delightful offer, and greatly appreciated by the walkers. As the party was exhausted and considered the event enjoyable to conclude following the afternoon tea, dinner options were not taken at a nearby pub. Members engaged in the pilgrimage for whatever reason they saw fit, as this was not necessarily a religious event. Members attire ranged over numerous periods and cultures that they felt appropriate for the occasion. All made an honest attempt to dress in a historical period and culture appropriate to the ages of interest in the SCA. Most members chose simple garb to match the occasion with preference to earlier periods. Appropriate footwear for a pilgrimage over gravel and bitumen roads, and uneven surfaces, witnessed everybody using modern shoes and hiking boots. Whilst there was discussion of using period accurate footwear, nobody was brave enough to attempt it. 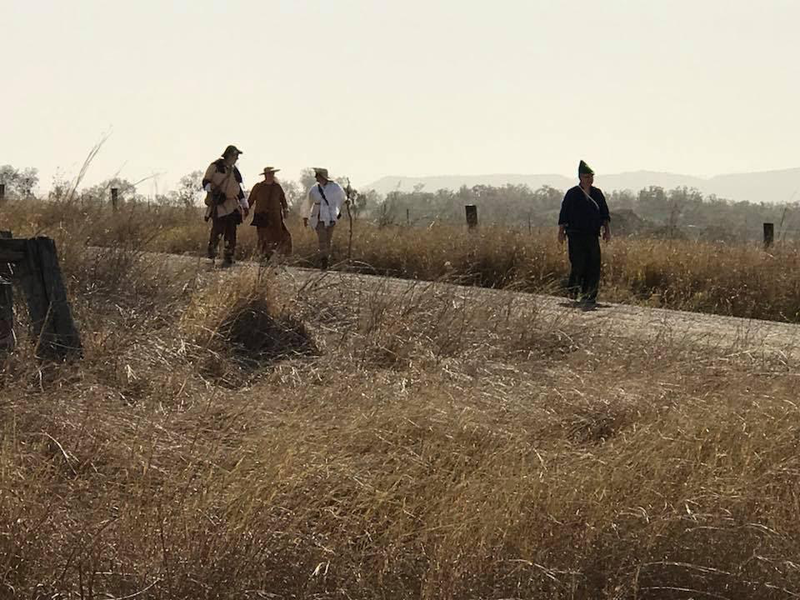 Members carried appropriate water and sustenance for the pilgrimage. A light meal was brought by each member. As we sat on a fallen tree truck in the shade for our luncheon it was a delight to reach into our pilgrim’s bags and retrieve cloth wrapped bread and harden cheeses that had become soft during the walk. Sun protection was essential – with all using sunscreen and appropriate headwear. The use of light linen scarfs were welcome reprieve for the back of the neck and tucked under the hat to hold in place. 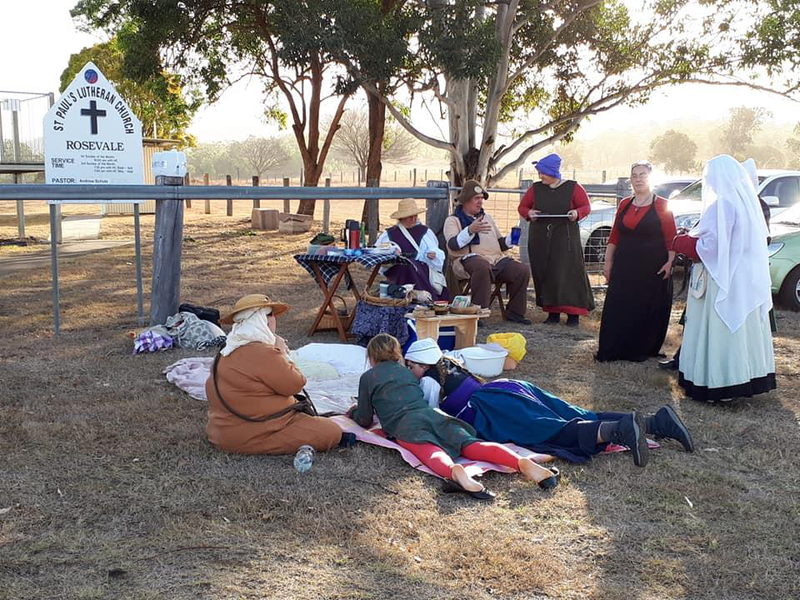 Carpooling was used to arrive at the starting place, Thornton, (Google Maps:190 Mulgowie Road, Thornton, Qld) and Return Carriage to Thornton from Rosevale (Google Maps: 572 Rosevale Road, Rosevale, Qld) after the pilgrimage. Mobile phone reception was intermittent, however on ridgetops signals was strongest. All pathways were able to be negotiated by 4WD vehicles in the case of emergencies, though none arose. 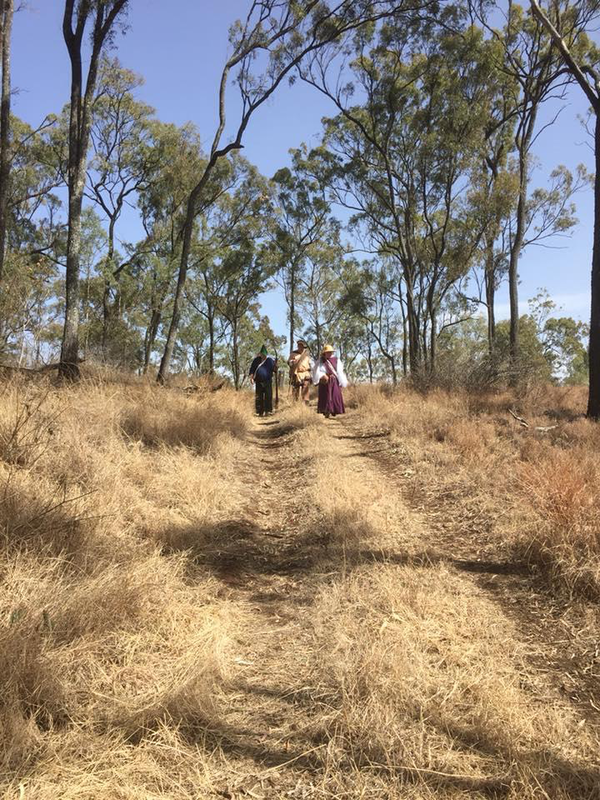 Whilst potential risks, such as wildlife (snakes, ticks), domestic animals (dogs, horses), dehydration, trip/slip hazards – unlevel ground, and roadside debris, no incidents requiring medical attention was required. Dogs that were encountered were either friendly or well fenced. One carpet snake was encountered literally guarding a gateway, and easily scared off with our pilgrimage’s walking sticks. Though this is an all-weather event, as we were going to do it no matter what weather was on offer, no threatening weather events were encountered. In fact, the day was a perfect early spring day of a most pleasant temperature and breezes. A dust storm impeded some of the anticipated mountain venues, which was a disappointment. Carpooling cost (fuel) needs to be considered and non-intrusively suggested to participants. The 24 km length of the walk discouraged some participants, thus whilst the length was intended to make it a meaningful challenge, the next event will have two half options, so participants may partake in the morning section or afternoon section or both. Rural toilet access was a pre-event concern. Adequate solutions for metropolitan members was not achieved. All available toilets will need to be identified, as public toilets were unexpectedly found at Warrell View (to the relief of travellers). This was a free event. Thus, afternoon tea was reliant on the generosity of members, which was how it was initiated. Future events should not expect or rely on this generosity, though may accept it if offered again. The pathway was initially intended to conclude at a rural pub. This was a disappointment when it was discovered that the Rosevale Retreatwas closed. Future pathways may consider well-established pubs. It was generally thought that the length (24 km) and choice of seasonal timing was excellent. However, longer distance pilgrimages would likely not be encouraged. Summer and Winter seasonal walks were discussed, however seasonal temperatures are likely to be discouraging. It was suggested that the Summer walk could be held as a full moon night affair. A support car was not initially considered. A flu-recovering member volunteered to perform this duty. This enabled water to be carried, and an emergency car to be available (which was used to ferry a walker back to their car to retrieve it whilst they had a rest from walking). Like the afternoon tea, this service was at the generosity of the member. Future events should not expect or rely on this generosity, though may accept it if offered again. On a final note, readers considering holding a pilgrimage in their Baronies and Cantons may appreciate what we used to consider in selection a pathway. 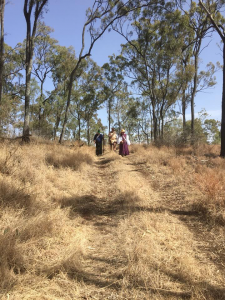 Firstly, we used The Bicentennial National Trial (https://www.bicentennialnationaltrail.com.au). It is a route from Cooktown, Far North Queensland, to Melbourne, Victoria. This pathway unites the Baronies and Cantons on the Eastern Seaboard of this grand continent and Kingdom. It would be a good starting point to research this pathway in your area. Next, what we looked for was quite country roads, so that traffic was minimal. Over the course of our pilgrimage of seven hours only about a dozen cars passed us. Unexpectedly of these vehicles, three stopped to ask us what we were doing. 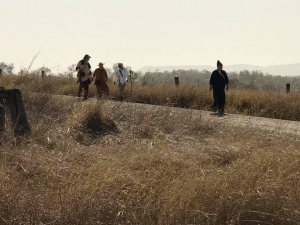 And once we explained that we were historical reenactors performing a pilgrimage, the drivers curiosity was rewarded. We suspected that the pictorial clues of simple garb, walking sticks, and pilgrim bags aided the recognition. Of the roads to choose, we made a preference for dirt roads, as they visually aided the feel of our period pilgrimage. The sections of dirty road that wound through treed hills were delightful. Next, a preference was given to traversing a low range so that stunning country views would reward and encourage the pilgrims, but importantly thematically we left one valley and entered another. This transition in landscape aided the feel that our pilgrimage had a change. Certainly, as we neared the end of our walk, looking back to a distant range that was the morning section of the walk on the horizon was remarkable. And lastly, ending the pilgrimage with an afternoon tea / late luncheon was important. This small catering event was an occasion of its own evolution, as members that couldn’t walk took the arrangement of the reception. As the walkers arrived it was obvious that the afternoon tea party was already been a joy for the people there. Our next pilgrimage is in March 2019, an autumnal event. Photograph from MD, LM, RD, and AK. Cooking is one of the many activities that sets humans apart from other animals. Since the dawn of man we have been heating food over flame and building tools to help us cook, from flat rocks to the ‘Tefal Harmony PRO titanium non-stick pan’. Over time, these objects have changed in construction materials, but their basic shape and function is easily recognisable. 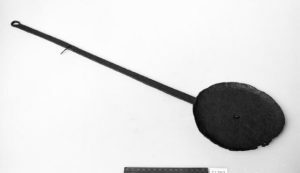 This article will discuss the reconstruction of a long-handled fry pan used to cook over an open fire or hearth in Dark Ages Norway, based on extant examples from 800-1200 AD. The overall size and handle shape of my pan is based on C16512 from Velo Norway. Particularly, I tried to imitate the shallow ‘S’ sweep that’s forged into the handle, the slight rise above the level of the pan, and the way the handle appears to taper and thicken at the pan end. “Panne”, C16512, Kulturhistorisk museum, UiO. I combined this handle shape with the pan profile from C1757 from Laerdal, Akre, Telemark, Norway. This pan has a more pronounced lip dished around the edge which I felt would make a more versatile implement. “Steikpanne (etter R430): Diverse gjenstander (gamle glassplater)”, C1757, Arkeologisk museum, UiS, and “Stekepanne av jern”, C1757, Kulturhistorisk museum, UiO. 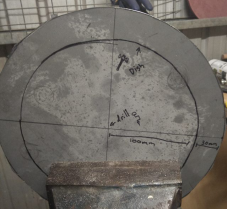 Working from the source photos, I chose to make a pan 260mm in diameter with a 30mm lip, dished 15mm deep. I decided to make the pan 2mm thick as I believed this would give the best balance of heat dispersal, rigidity and weight. 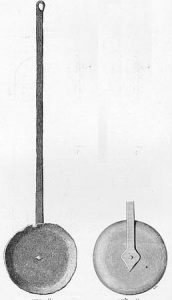 The handle was planned to be 700 mm long and 19mm at its widest. 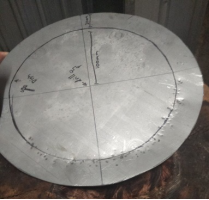 Pan: Dished from a 300x300x2mm sheet cut into a 260mm diameter circle. 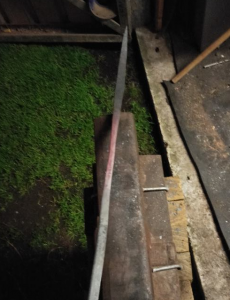 (The particular sheet of steel I obtained for this project was covered in zinc (not galvanized), which was easily removed with sandpaper and then burned off at 900 degrees from a safe distance.) 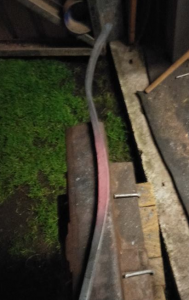 I believe that the original pan would have been flattened from a billet but I don’t have a forge large enough to work that size of a material. 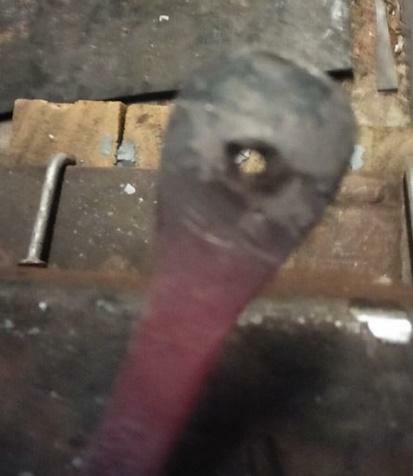 Rivet: Cut from a 5x100mm bullet head nail. Seasoning: Food-safe flaxseed/linseed oil, which is known to have been used on wood products in Dark Ages Scandinavia and is commonly used to treat cast iron today. 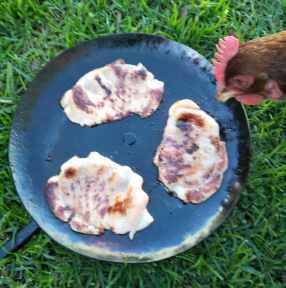 The original skillet was made from iron, but being unable to obtain or manufacture authentic Dark Ages iron, I elected to use a modern low carbon steel commonly sold as ‘mild steel’. Mild steel carbon ranges between 0.05-0.25%, making it very malleable and relatively easy to forge. Its maximum forging temperature is 1260 degrees Celsius, which is an orange yellow. I wasn’t too precise with forging temperatures, relying on maintaining a bright orange colour while working. 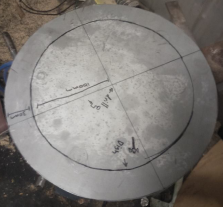 Having a low carbon content means that mild steel doesn’t harden or temper, which is fine for this project as the pan does not require a sharp edge nor does it need to flex. However, this meant parts had to be fairly robust to prevent them being bent or damaged. I used only hand tools for this project, most of which were available in the period. 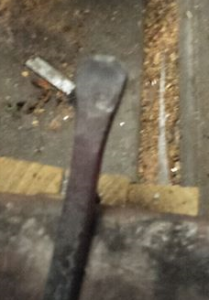 Hot cut iron bar to 65cm by driving the heated bar onto a sharp edge with your hammer. (Here I have used a block splitter for the job.) Between each strike, roll the bar to the next face keep the cut square and deformation uniform. 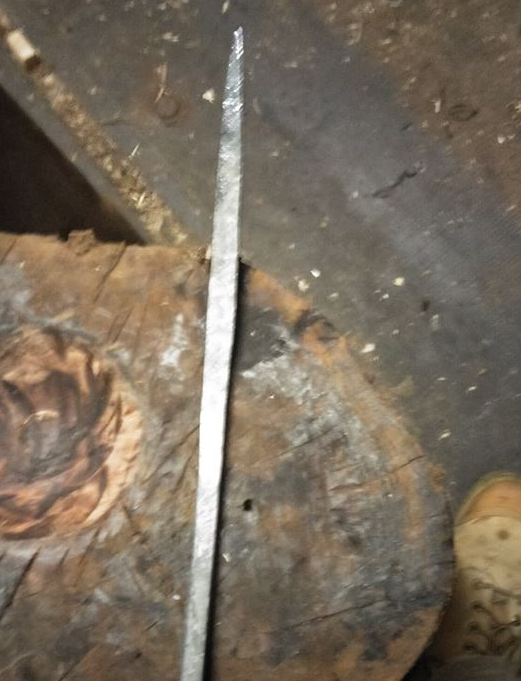 Draw out one end of the bar to a chiselled tip. 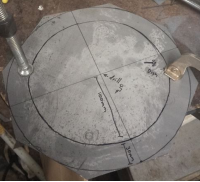 Working on the far edge of the anvil will allow clearance to land angled blows on the tapered face, but between every angled blow make sure to roll the piece 90 degrees and land a flat blow to keep the sides square. To prevent cracking be generous with heat and direct the force of each blow back towards the work piece. Once the taper is set, true the work up so the chisel is centred. Trying not to disrupt the tip, create the top profile by walking flat even blows down the work piece, thus thinning and widening it. Any bulges can be trued up by rolling 90 degrees striking them back in. The piece wants curve towards the hammer blows as the material moves – this is easy to correct in later steps but here it gives us a the top and bottom face of the handle. Once happy with the shape, it’s a good idea to cool this area before moving on to prevent bruising. Moving to the mid-section, with an isolated heat, start shaping the side profile. As in Step 3, use flat even hammer blows and pull the piece towards you to walk the hammer along the worked area. This section will need to remain centred so flip the work after every pass. 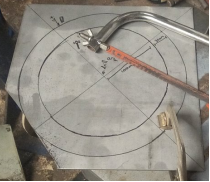 In this section the curve is in the unworked plane and so it has to be deliberately introduced by rounding over a horn or bending on an anvil. 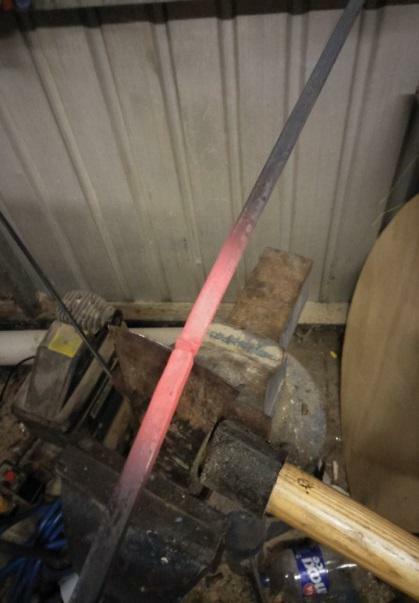 The material will thicken inside the curve and thin on the outside so this should be evened out with the hammer. Once this section is to shape, blend it with the former section, then cool. 5. 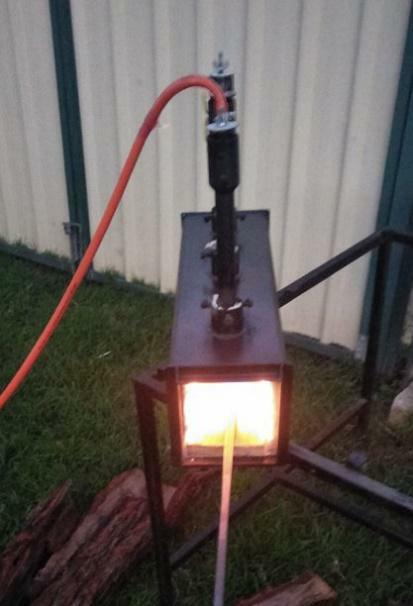 Once it’s safe to hold, heat the unworked end in the forge. Working on the near edge of the anvil with flat blows, spread the material to create an inch-wide circle. 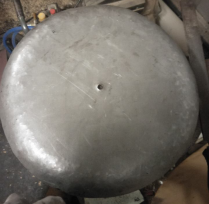 The corners can be tapped to make them round by holding the shoulder at a 45-degree angle on the rounded edge of the anvil or a horn to act as a fuller from the bottom. The flattened section should be flush with top face of piece. 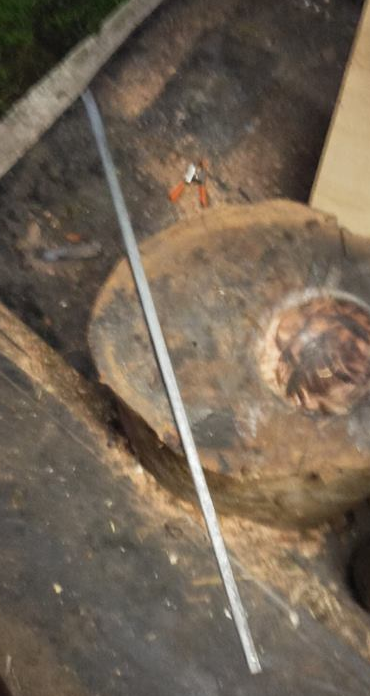 To mark the hole, heat the eye section till red hot and initially mark the centre with a punch against the anvil. 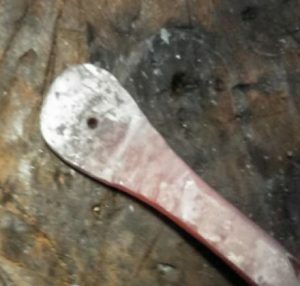 Once the hole is started, a ‘Hardy Hole’, or in this case a hard wood surface, can be used as a support to drive a narrowly tapered punch through the material. Here I have used a needle file before moving to a 5mm nail to drift the hole larger. Lubricating the punches and drifts with beeswax or petroleum jelly will prevent them fusing with the work. Once hole is to size, massage the rough side of the hole flat using the ball peen hammer. If this overly deforms the hole, re-drift. Now the basic shape has been created, it’s time to do a final pass to true everything up and blend all the curves together. I found my ‘S’ sweep profile in the photos to be too radical so I toned it down in the vice. Season with flaxseed oil to prevent rust. Gently warm handle to about 100 degrees and apply oil with a cloth and continue to warm until oil polymerises. Repeat till a rich black is obtained. Allow to cool and then add a wet oil layer and let dry. As explained above, in period the pan would have been flattened and dished out of a billet. 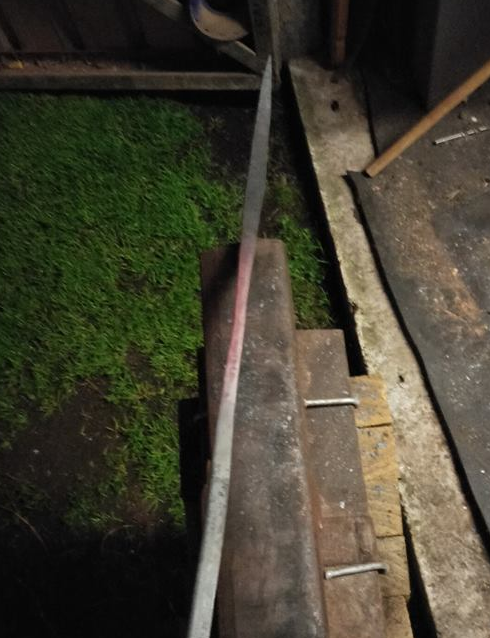 This would entail a lot less wastage than cutting it out, but I feel it would still have been necessary to clean up with a file and do some trimming at times, so the method below isn’t completely off track. 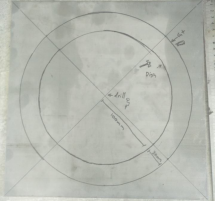 Find the centre of the plate using by marking diagonally. Then with centre punch. 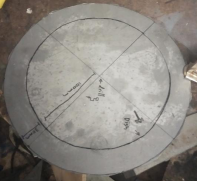 Use a compass on this mark to draw two concentric circles of a 100mm radius and a 130mm radius. Clamp to work bench horizontally and use a hack saw to dock the square octagon. Take off the corners as close as you can to the outer circle and rotate the work piece after each cut. Support the work on the corner of the work bench to avoid flex and shudder. Once finished remove the newly created corners to make a hexadecagon. File and round off any remaining corners until it’s smoothed to the outer line. Rotate the work, focusing on the high spots, then blending them as you go. Place the pan blank over the hole in the dishing stump and begin dishing with the ball peen by following the inner circle with closely stacked strikes.Once back to the start, go round again closer to the edge, while holding the pan at 45 degrees to the stump to give the lip a rounded profile. Check rim level by placing upside down on a flat surface. Planish out any large bumps. This time the hole can be punched cold, using the center punch and nail against the dishing stump. File bottom side of the hole till flush. Use 240 grit sandpaper and burn off last traces of zinc. I took the chance while the pan was hot to do the first few layers of flax seed oil. This was counterproductive because I had to reheat the rivet in later steps which burnt it off, but you will see the pan partially blacken in the following steps. Cut nail to 20mm long with the hack saw and file a chamfer on the cut end, this will help with peening the rivet and assembling the piece. Remove any obvious modern markings with file. Assemble by sliding the rivet through the bottom of the handle then through the bottom of the pan. Check that it protrudes far enough for a good spread but not so far that it will just bend over before spreading. If the rivet goes wrong it would be a real struggle involving the hacksaw to get it back out for a second try. 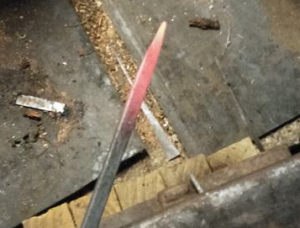 Once in place, heat the rivet with the front of the forge. 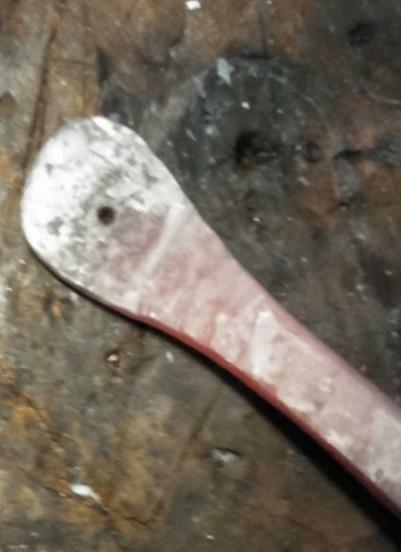 Then place the bottom of the rivet on the anvil and peen flat using the ball of the hammer. Use firm strikes in a spiral pattern around the top of the rivet until it’s close to flush, then smooth out it flat side of hammer. Season both top and bottom of pan with flaxseed oil and gentle heat. I placed the pan face up on the ground to see how the pan sat and found it leaning to one side slightly so I placed it in the handle in the vice and gentle forced it to square by pushing down on the high edge and pulling up on the other. The last thing to do is cook up some tasty eats like bacon and flatbread. This project turned out well: it’s not too heavy, but very robust. I wouldn’t want to carry it long distances, but for an object kept next to the hearth and used every day, it’s just built to last. 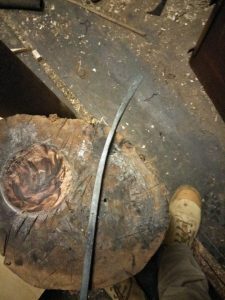 I can only discuss conjecture on the ‘S’ profile of the handle: it makes sense for clearing the edge of a fireplace or hearth, but I was surprised to find that having a lower centre of gravity makes the skillet pretty easy to balance – it naturally wants to hang level in the hand. That said, the curve in my final product doesn’t quite match the museum piece and if I was to do this project again, I would try to stay more true to the original. “Panne”, C16512, Kulturhistorisk museum, UiO. Images accessed June 3, 2018, at http://www.unimus.no/photos/khm/198110/?f=html (front view) and http://www.unimus.no/photos/khm/198111/?f=html (back view). “Stekepanne av jern”, C1757, Kulturhistorisk museum, UiO. Image accessed June 3, 2018, at http://www.unimus.no/photos/khm/50630/?f=html. “Steikpanne (etter R430): Diverse gjenstander (gamle glassplater)”, C1757, Arkeologisk museum, UiS. Image accessed June 3, 2018, at http://www.unimus.no/photos/am/102790/?f=html. Historiska Museet (The Swedish History Museum), Mästermyr (SHM 21592) (2011). Accessed June 4, 2018, at http://kulturarvsdata.se/shm/site/html/39216. Nietfield, D, Heat Colours for Blacksmiths (March 2010). Accessed June 3, 2018, at http://www.blksmth.com/heat_colors.htm. Total Materia, Classification of Carbon and Low-Allow Steels (November 2001). Accessed June 3, 2018, at http://www.totalmateria.com/articles/Art62.htm. Ward, C, Woodworking in the Viking Age (December 2005). 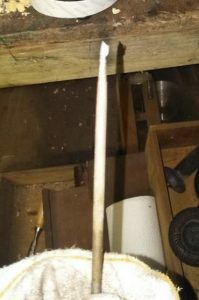 Accessed June 4, 2018, at http://www.vikinganswerlady.com/wood.shtml. 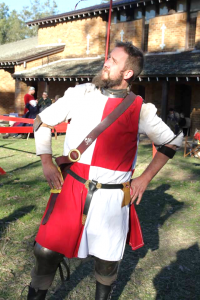 Hi, I’m Johann, (or Lord Lord Jon Huslangr if you’re fancy) proprietor of the “Johann the Carpenter: an Unofficial SCA Newcomer’s blog” Facebook page. I was asked a few months back to share with you the philosophy/lifestyle-choice that is Speed Building and how you too, can apply it to your SCA adventures. I’ve been in the SCA for just on a year now; residing in the Barony of Politarchopolis in Canberra (rich in Peers and red fabric). Mundanely, I’m a residential carpenter; specialising in “unique” constructions, meaning my life is spent solving problems with no two tasks the same, whoop whoop! By now you might be thinking; “Aw man, he has a mad advantage to doing arts and sciences stuff. I’d never have those skills!” I’m here to tell you that mundane skills and how they transfer into the SCA stops around about the time you start researching how to ‘do things the period way’. Mundane skills and historic skills can be very different and, despite having an advantage in my craft, I still need a lot of motivation to translate my skills into SCA arts and sciences projects. But enough of the intro, let’s talk Speedbuilding! At my first event I was introduced to a concept of ‘Doers & Sayers’ – there are those that DO stuff and those that SAY they’re going to do stuff. Now, whether you’re of the former or feel embarrassed that you may fit better into the latter, the fact that you’re thinking about it at all is a big first step. Motivation is a key factor to a lot of activities and I, too, have seen both ends of the spectrum. In fact, nothing motivates me more than the rush of a deadline… and the ‘it’s only ever two weeks before Festival’ platitude. Speed Building is a type of process best described by just getting in there and doing a thing in the quickest way possible; Sometimes many times over. It prioritises making a completed product quickly over making something historically accurate. 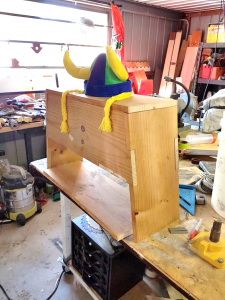 For example, if I want to make a 6-plank chest reminiscent of the early Viking period, Speed Building would involve choosing the shortest path to achieving that goal. At this point we’ve probably lost a few of our Laurels-readers but here’s the skinny; the more you practice, the better you get. I know, I sound like one of the Knight Instructors now but seriously: THE MORE YOU PRACTICE, THE BETTER YOU GET. So, my first 6-plank chest was patterned using Pinterest (urgh, I know right?) with the dimensions governed by the timber I had lying around (rescued pinewood shelving pieces from a demolition job). Not exactly a textbook methodology of research or design but this is Speed Building so producing something is better than being overwhelmed by the hurdles of sourcing period-accurate materials on your first attempt. So away I went: cutting, gluing, nailing, hammering, and painting. Before I knew it I had a chest, all medieval like; great for storing things, carrying things or just sitting on it (by far the most important design trait!) If I had gotten caught up in the detail of trying to perfectly recreate a Viking period chest, I may have been overwhelmed and never finished anything. But, by engaging my philosophy of the Speed Build I had a functional chest in no time. And to me, that’s it. Speed Building isn’t about perfection; it’s about having a go. 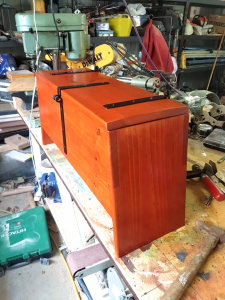 Having made my first chest, I then had the brain space to think about where I could do things better or “more period” next time. The second chest has better joints on the sides to direct the load-pathways and hold its shape, and I’m confident the third will be even better still. So, go on, have a go, make all the things! Use whatever techniques you’re comfortable with whether they’re period or not. And if you’re so inspired, go again; increase the level of difficulty and aim for more historic! Maybe even keep a record like a projects diary, photographs, or blog so you can review and improve your skills and method of producing the item (it’s also great for arts and sciences competition documentation *sly wink*). And, if you ever get stuck, there’s always a super enthusiastic Laurel lurking nearby that would be thrilled to discuss the project and direct you to someone else that’s doing similar stuff! I’m Johann, thanks for reading, make all the things, oh and then I found 20 gold pieces! The ribbon was three 20 m rolls of 10 mm grosgrain cut into approximately 10 cm lengths. The recipient could pin the ribbon to their token. At the end of the evening, those with the most of a colour received a prize for that aspect. Lady Mairi oversaw the ribbons at the front desk. I believe most people received at least one ribbon. People seemed to like both giving and receiving the ribbons and they added to the visual pleasure of the evening and feeling of participation. There was also a mask making competition, won by Anfridh I Osby. New member of the guild: Mistress Katherne Rischer, for dance, presented with her rondel token by Mistress Marguerite de Rada y Sylva, one of the original members of the guild. Rondel meeting: 16 rondels and semibreves attended an enthusiastic meeting in the afternoon. Jeneur sent minutes of the meeting to the Lochac Dance list at its conclusion. Daytime dance classes: There were four classes scheduled from 12:30 – 4pm, with Aliette, Anfridh, Annabel and Madelina as teachers for a variety of English Country, C15th and C16th Italian dances. We actually ended up doing classes that suited the people present, with some deliberate time slippage. Hall set up: Large, square wooden floor clear for dancing. Front desk right next to single entry point (there was a second emergency exit available but not used). Musicians on the stage. Banners from Rowany’s stash. Fresh variegated ivy from someone’s garden. Decorative masks on tables set with white cloths around the edge of the room, lots of chairs around the edge of the room. Buffet on side tables near kitchen, drinks on tables in an L shape that made a kind of bar between the dance floor and the kitchen, creating a buffer for kitchen staff. Rubbish bin next to buffet table. Dance lists and menus stuck up around the hall, at the front desk, with the musicians. Dance list: (see last page) The list of dances was published for comment a few weeks in advance on the Lochac Dance email list and Facebook group. Content was based on dances practised at Rowany Dance terms in the last year. Number of dances and sets was inspired by Flametree Ball and St Vitas. We included many styles of period dance to allow for rondel/semibreve assessment. We got through all of the dances except for Canarios and Petit Vriens. There was no time for requests except the very last dance, the Bear Dance, very popular particularly with present and past collegians of St Ursula (Be the Bear!). Participation at the ball: Dance participation was excellent. For example, I noted we had four sets of six dancers for set 2, Picking of Sticks, Grimstock, Wherligig and Gelosia – 24 dancers on the floor, despite some of these being more complex dances; and when I called for everyone to join in the Mixed/Cut Branles at the end of the first half, we had to make 2 large concentric circles, just about everyone joined in, I estimate 40 or more dancers. Dancers covered the full range from absolute beginners to highly experienced. Easily 12 dancers still on the floor for the last dance even though it was after 10 pm and we had danced for more than three hours during the ball, plus more than three hours of classes during the day. Fantastic! Catering: Great. Heaps of water and cordial in lots of pitchers. Buffet of finger food refreshed through the evening including fruit platters. Marozia based the menu as much as possible on period sources. Should have had the competition categories and corresponding ribbon colours written down prominently at the ball. Should have published the competition categories in advance. Should have printed the dance sets in larger font. The order of the dance list – I put what I consider more difficult dances in the middle of the first set, before people were too tired, so lots of people joined in despite complexity. I ended the first half with the Mixed/Cut Branles, everyone joined in, then everyone was very ready for the interval at the end of Aridan. The competition format – people joined in willingly handing out ribbons and usually told the person why they were giving them. Stewarding/kitchen team got courtesy ribbons. The theme – just about everyone had a mask, there were mask making materials available at the event and a workshop during the day. People wore very speccy clothes and looked fantastic. Annabel de Swinburne, dance team, Bal d’Argent 2018. I have just taken the position of Deputy Cockatrice editor, and I am looking forward to getting the wonderful articles submitted to The Cockatrice up on this blog for you all to see. Also keen to hear about all the great A&S activities and events from around the Kingdom, pics of things you are working on, things you are researching, or any A&S related stuff that might be of interest to others in the Kingdom. If you email editor.cockatrice.lochac.sca.org with the subject ‘Blog Content’, it will be given full consideration. …along with photos by Lady Veronica Bellini and Lady Anne Sabina Schmidt on the theme of ‘Behind the Scenes’. I’m also pleased to announce that each of these articles is going to be posted in full as a blog post, thanks to the marvellous Master Grim of Thornby, who has volunteered to become Cockatrice’s Deputy Editor. Look for the first one sometime in the next couple of weeks! Cockatrice May A.S. 53 Now Online! Some of the teachers from this year’s Rowany Festival have offered to share their class handouts with the kingdom!